Artist G. Unnikrishnan is a weaver of images, a chronicler of an imagined land, and a magic draughtsman with a spell. He is also an artist-teacher with long years of experience to count. His works are mostly drawings, even though he is good at painting too. It is his drawings that enchant the art lovers, more due to the authenticity of lines, forms, space and the innumerous visual tales in them. The several figures that activate the picture surfaces ripple across the works and create a rhythm of life. These works, that are part of his continuing solo exhibitions in different places in Kerala, grow into each other, exchange with each other and even merge with each other. They largely depict the artist’s observations of the local life and rural folk. The surprising factor is that these people who occupy his works are often drawn from memory. 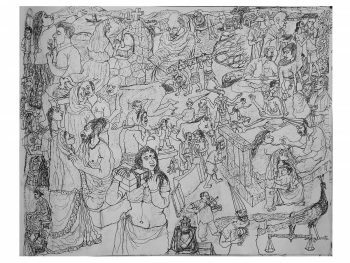 Artist G. Unnikrishnan envisions a place occupied by people, or to be precise characters, that emerge from the locality, or sometimes from the fables, or else from his fictional imaginations. We may observe the images of the intertwined lovers at a rendezvous or having an interlude uninterrupted by the crowd around, several mothers with child that reminds us the Madonna, a preacher holding a book and speaking into the air but largely unnoticed by others, worshippers praying for benevolence or redemption, old dying people, sadhus, destitute loners, instrument players, naughty children at their best, clowns or harlequins, street vendors and performers, bicycle riders, domestic animals, birds and the list goes endless. Signs of an irretrievable past and its legacies are visible in the activities of the people that the artist has visualized but without being romantically nostalgic. The archaic architecture of the old streets, thatched roof houses, schools, temples and churches or even the wells remain as witness to the gathering (or leaving?) crowd of people. The artist has orchestrated the people in the drawings in several layers, yet giving due place and importance and never pushing them into any periphery, often composing some figures in large proportion and drawing smaller figures in the gaps. There is no specific indication of a land or its features except for the large sacred fig trees, mango trees, palm trees, houses or parts of buildings and the river bank. 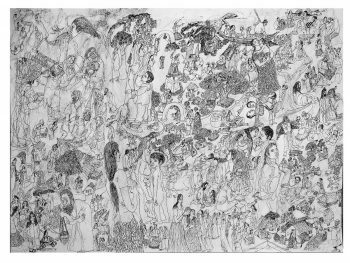 These drawings may appear like an assembling of people at a village fair or festival, which being the visual strategy employed by the artist to web his lucid, streaming memory of a place. 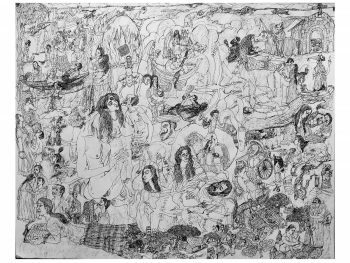 Lines, forms and figures flow spontaneously from the pen of artist G.Unnikrishnan that he enjoys the ecstasy and often finish a complete work in a single sitting of just a few hours. 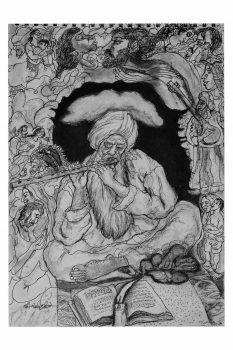 He repeatedly draws a Sufi in his works playing an instrument and singing to his heart’s content. Perhaps this is one figure the artist finds a personification of his self and soul. It can be better understood that the people, the animals and the place in his works are visualization of the Sufi’s songs. 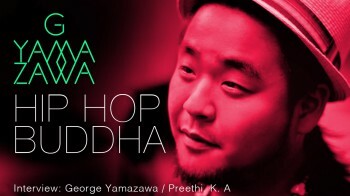 He also repeatedly draws the images of Buddha and Gandhi who are harbingers of peace and sanctify this imaginary land. Gandhi is often drawn seated with the iconic charkha and with a not so pleasant face. 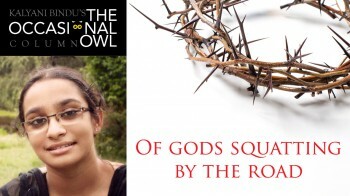 Perhaps Gandhi is in turmoil considering the plight of his nation in current times. Buddha is shown in his eternal, peaceful repose with a benevolent smile that heals the painful tales of this land. 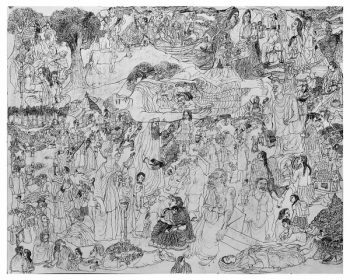 Even prophets and poets like Kabir and Surdas wander as saint-paupers in the drawings of Unnikrishnan. One could make out the artist’s liking for simple lives and also his philosophical position or leaning towards a harmonious co-existence which is still a dream unrealized in this intolerant world. It is remarkable to find that these drawings do not have a starting point, or a spot where the artist withdraws and leaves the rest of the narration to the viewer. Everything exists simultaneously and incarnates the artist’s mind. There is neither a foreground nor a background. The artist has represented all from an aerial perspective, making possible a grand view like a history painting. Yet he has not valourized the subjects, but instead have made them all humble, loveable people of a land where various cultures merge. Towards this the artist has drawn inspiration from the local myths and stories, particularly the Padayani rituals, the Kettukazhcha displays, and the church processions in and around Onattukara (current day Mavelikara and nearby regions) from where he hails. Clowns in elongated caps inhabit these drawings with humorous, sarcastic smiles. They are the vidhushakas in this theatre of daily grind. 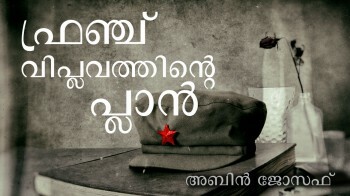 It would not be surprising if one could discover the ambience of literary characters and geography as depicted in the stories and novels of Vaikom Muhamed Basheer, O.V. Vijayan or V.K.N. in these drawings. Moreover the inspiration from the paintings of Peter Brueghel is noteworthy here for the compositional device employed. Even though these drawings have an air of narrative paintings in them they do not visualize any literary work or tell any specific story. Instead this kaleidoscope of images, of people and lives, remembers and imagines a place and an epoch in continuum. Not all the images have logic to them; many figures are utterly absurd and disturbing like in any modern or contemporary work of art. In effect these drawings impact as a metaphor (of human drama) and keeps working in the mind of the viewer even after they left the gallery. 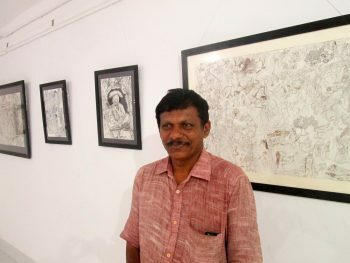 G.Unnikrishnan’s drawings stay apart for their uniqueness and authenticity. His drawings are a delight for those who still expect a pinch of humaneness in art. 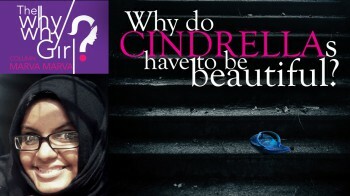 After all it is said that Art is the highest form of Hope for humanity. Born in 1959. Studied Drawing and Painting at Raja Ravi Varma Institute of Fine Arts, Mavelikara and received Diploma in Painting. 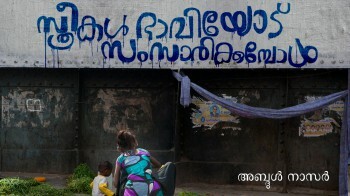 Underwent 2 year training programme at College of Fine Arts Kerala, Thiruvananthapuram. Held solo exhibitions of his paintings and drawings at Thrissur, Mavelikara, Ernakulam, Kottayam, Alappuzha and Kayamkulam in Kerala. Been part of several group exhibitions and art camps. Was awarded the ‘State Award’ by Kerala Lalitha Kala Akademi in 1979 and 1999, Raja Ravi Varma Smaraka Award in 1996 and Kerala Chithrakala Parishath Award in 1983. He served as Senior Art Instructor and then as Associate Professor in Painting at Raja Ravi Varma College of Fine Arts, Mavelikara for long 30 years. 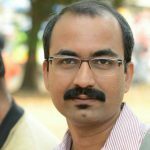 Currently lives and works in Mavelikara, Kerala.